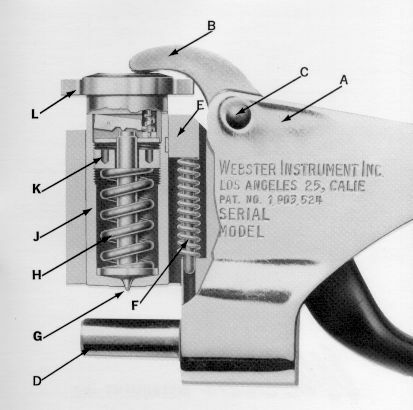 This cutaway view of a Webster Hardness Tester shows the working parts common to all quality control testers. Each tester is identified with a model and serial number stamped on the frame and should be mentioned in all correspondences relative to repair or when ordering parts. Penetrators should be examined periodically for wear and replaced with new ones. Please note the following for replacement parts: Penetrators and load springs differ with each tester model. All of the other parts are common to all three testers. To order replacement parts or for questions on repairs, please contact our Customer Service Department at (310)620-9313.